Shielding or creating other forms of protection to keep from merging with, or being otherwise affected by, the energies of another is a popular topic in many Reiki circles. While remaining protective against absorbing unbalanced or stagnant energy is an essential consideration, there is an alternative to shielding. This alternative is called “Flowing” and while it is a relatively new concept, it is a practice that is becoming more relevant as we continue to broaden our knowledge of the working practicalities of Life Force Energy. Consider for a moment that all Life Force Energy is a shared resource. It is constantly moving and the energy flowing through you in this present moment will not be the same energy, even in the near future. In fact, this same energy will be found in animals, trees, and everything else that makes up the living matter of this world. With this in mind, no one ever owns their own energy; it is a shared and ever flowing commodity. This is scientifically measurable and the very essence of Oneness. Knowing that the energy is a shared commodity, it makes sense that when you create a shield or bubble, these protective devices create partitions. These partitions put the energy you are working with at risk of becoming stagnant, much the same as a puddle of water that has been partitioned away from the flow of the river. As everyone knows, a stagnant puddle of water is breeding ground for disease. In the very same way, many diseases of the mind, body, spirit system are due to energy becoming stuck and then stagnant. When you help someone release dis-eased energy through activities such as a Reiki treatment, you give create the opportunity for the healing process to become stimulated. The Reiki flows through you, into another and creates a series of events which help promote healing. This energy doesn’t stop there however, it continues to flow. Sometimes more concentrated and sometimes very subtle, it deepens and moves because this energy, Life Force Energy, is the river of life. This river is created to continuously flow. When you begin to flow energy, it works much the same as a bubbling brook. Just as a smoothly running river remains clean and clear by sweeping debris away from the source of where it began, allowing Reiki energy to flow through you and through who you are sending Reiki to, human or otherwise, will allow the energy to pick up the debris, or dis-ease, and flow away from the source and away from where it had become stagnant. Negative energies will flow away from you, not back toward you, so there will be no need to shield or otherwise protect yourself. If you feel the need, you may ground the energy into the middle of the earth to carry negative energies to a place where it will become nourishment. 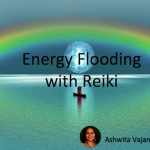 Before you begin Flowing as an alternative to Reiki Shielding, you will want to make sure you have cleared through any blocks or partitions you may have within your own system that may be interrupting an otherwise free flow of energy. A Reiki session, meditation, chakra clearing, asking for help from your chosen deity, or bathing in Epsom salts are all great choices to help clear your energy blocks. When the energy is flowing freely, without partition, you will notice a deepening of your connection to Oneness and this will allow you to progress as an exceedingly more effective practitioner. Yes. 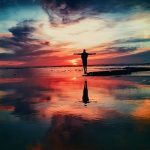 I was always taught – and I always teach now – that Reiki is a one-way flow so there is never any need to shield or protect or anything like that, because Reiki is its own protection. I am also a spiritual healer, and I much prefer to use Reiki for this very reason. I feel much safer with Reiki. I agree Chris, Reiki is its own protection, thank you for teaching that way! Thank you Michelle, I’m so happy you liked it. I think disconnecting from the client is an important practice to remember! Realy a good article.after a session grounding and reiky shower is enough.but some time after reiki we got lethargic. Grounding is sufficient for it?